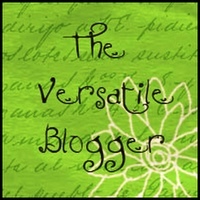 First a huge THANK YOU to GLUTENVYGIRL for nominating me for this Versatile Blogger award! 🙂 Please take a second and check out her blog as she “stumbles around, reading books, learning, and attempting to simultaneously create gluten-free deliciousness as well as quick easy ways to feed my family.” She is fabulous! (Not So) Bored in Arizona – “Friends don’t let friends be bored” There is no reason to be in such a beautiful state and not find something to do. This blogger lists some fun and inexpensive activities to get you out, moving, sightseeing and eating when you are in Arizona! Rantings of an Amateur Chef – “Food…cooking…eating….tools – What works, and what doesn’t!” This is a great selection of recipes, product reviews, tips, tools and even specialty diets. I am J The Blog – “a 30-year-old chick hoping to empower myself as well as others all while trying to adjust to life and being gluten-free!” J shares all things gluten-free from awareness, to food to beauty. Gluten Free? Gimme Three! – “A realist’s take on living gluten-free” Wonderful information especially if you are in the DC or NYC area where she lists places you can easily eat gluten-free. Adopting James – A couple who wants to adopt James. They share short stories to read, book and movie recommendations, thoughts from the Bible, and adoption news. They are hoping to generate enough activity on their blog to grab publishers’ attention so that they’ll want to publish their books. Once published, sales will help fund their mission to adopt James. The Nose Always Knows: Reviews from a Perfume Addict – Passion for perfume, has prompted her to write about the scents she owns, the ones she loves, what they smell like, and where you can buy them. 1. I love animals……..sometimes more than people! We have a cute gray tiger-stripe cat named “Miss Kitty” who runs the house. We also have a very large, old dog, an English Mastiff named Mystical Merlin. Believe it or not he is also gluten intolerant and allergic to a ton of stuff!! So as long as he and I are on the same page eating………all is good! LOL! You laugh……..but try finding food for a 250 lb dog that does not contain wheat, eggs, oats or poultry! 2. I consider myself an amateur foodie. I absolutely LOVE to eat, try different things and new regional tastes. I also love to combine some of those things that don’t normally go together. My new gluten-intolerance has put a whole new spin on foods……..but this is a great thing…..a real challenge with more new stuff to try! 3. I am extremely passionate about the things I believe in! I would not use the term opinionated because I do value other people’s opinions even if they are not the same as my own. I am usually very vocal about these things I am passionate about as well and will not hesitate to speak out. Look out! 4. I absolutely canNOT sing! Despite this I do sing to the full extent my lungs will let me when I am by myself in the car. I always knew I could not sing, but it was confirmed one day when my daughter was very young, I’d say about a year and a half. She didn’t feel well so I had her in my lap in the rocking chair. As I rocked I thought I will sing her a little something to make her feel better. As I continued to sing, she looked at me ever so sweetly, put her finger to my lips and said “mommy………please don’t sing”. And there you have it. The last time I sang in public! 5. I am an internet junkie. I love all things computer and internet! I’ve had a computer for years and years……..back when you had the choice of the green or amber screen! Back before there were laptops! WOW this is really making me sound OLD. **sigh** Oh and I’ve had the same email address since 1995! 6. I have a fully functioning Atari game complete with joysticks and paddles. I’ve got original 20+ games as well. We have not used it in many, many years, but did pull it out for the kids to see. They were clearly NOT as impressed with Kaboom or Pit Fall the way that I was back then! LOL!! 7. I am ambidextrous! HA! I bet you’re glad you know that now. LOL I am naturally left-handed but when I was in grade school they did not allow you to be left-handed. Now that I think back, that really was ridiculous! In any case, I was forced to write, cut etc… with my right hand. As an adult my right-hand writing skills have seriously declined………but I can still do it! So there you are 7 things I bet you didn’t know about me. I am very excited to get this award! And I hope that my blog supplies you with all sorts of useful information. Thank you so much! This is such a fun award! I got my diagnosis last April while my husaabnd was in the process of being transferred from San Antonio, TX to the freaking middle of nowhere, Oklahoma. There is VERY LITTLE access to any gluten free products here, so I have not been able to try most of the things on this survey. Of the things I have tried like Bob’s Red Mill products they have been disgusting. I do use Gluten Free Mama’s products nearly every day and have never been dissatisfied.It is a shame there isn’t more access to GF products in towns that are 100 miles away from civilization! I am stuck with a small Wal-Mart and a Trent tiny grocery store neither of which will order GF items even after my husband and I have explained our situation. If a supplier/distributor happens to be reading this, please try to get to the smaller communities and not just the big cities! You are welcome! I enjoy your posts very much! Thanks! I hadn’t really ever thought of myself as “versatile”, but so happy to be included! You are welcome! You talk about a bunch of different aspects of gluten-free – food, drinks, symptoms, places etc. That is versatile to me! I have enjoyed what I have seen so far on your blog……..just kinda bummed I don’t live in your area!! The absolute best gletun free pizza is done by a chain in the Seattle/Everett area called Garlic Jim’s Famous Gourmet Pizza. I have had the gourmet garlic and the veggie but I discovered they also do a cheese, four cheese and pepperoni. I have eaten alot of gletun free pizza but this one is as close to a real pizza as you will ever get. I really wanted this pizza so I got ambitious and tracked down where they come from and the Garlic Jim’s chain has their own food distributorship called Pacific Coast Foods in Everett, WA. I told them they need to get this delicious product into more places in the Seattle area so I can get it into my neighborhood. Heaven would be to walk out my door, walk down the block and get a gletun free pizza to die for. Thanks Garlic Jim’s Famous Gourmet Pizza for doing gletun free pizza right!!!!!!!!!!!! Having Celiac is not easy and people just don’t ureanstdnd how we just can’t eat a little bit of something! We look good on the outside but our insides just can’t take Wheat, Rye or Barley. I love cider didn’t know GF was available. Now I can’t wait to try some GF! Got some great ideas from your survey of other restaurants that have GF available and other sources where I can buy GF FOOD!Thanks! OMG Alex you are sooooo right! If I had a dollar for every time someone has said “can’t you have just a bite?”! Some just don’t get it. While I miss some things, I am very encouraged about all of the strides being made in gluten-free foods. I really don’t feel like I’m missing out on too much!